On my Etsy shop, you can now find a new section titled One of a Kind featuring unreleased perfumes. These one-of-a-kind creations are not planned to be included in my collection, and are fascinating experiments in the art of perfumery. In reality, they are a custom scent that you can adopt off-the-shelf. They are all presented in my signature frosted tear drop shape flacon, unless stated otherwise. I am really excited about this opportunity to share with the world some of my latest creations, some of which are really innovative. And at the same time, I can keep my existing collection as uncluttered as possible while letting my creativity loose... This way everybody wins! Currently up for adoption are Sacred Oud and Frangipanni Gloves (I've blogged about it here before). 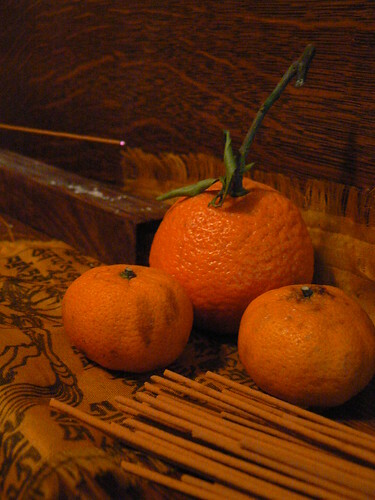 Tangerines & Sandalwood, originally uploaded by Ayala Moriel. These two cute tangerines were given to me by Monique at my holiday soiree (they were fresher and brighter a week ago, I can assure you, but I procrastinated on this photoshoot) and they got me thinking again about the sandalwood-mandarin duo. As a result, I’m inspired to build something around this accord, or more likely - re-visit my ginger & amber perfume and add a sandalwood element to it. I haven’t started working on this mod yet (scheduled to be mod #6). This week I was too busy baking cookies and entertaining as a way to cope with the snow and the extremely low temperatures (-8 during the day at times, which is very unusual for Vancouver at any given time). I still have to work on mod #5 with magnolia lily and jasmine to flesh out the heart and give the perfume more body. It sure is interesting to see how this perfume develops in teeny-tiny steps every time. In the meantime, I’m using a shortcut and wearing some Obsession eau de toilette and resisting the temptation of taking advantage of the Boxing day specials and finally get myself the parfum extrait. The large tangerines, by the way, were the best ones I’ve ever found in Vancouver in my 10+ years of living here. They turned out so great that I used them in a new ginger wafers recipe and it made it quite amazing really. I will post my recipe here soon, promise. Happy Holidays!, originally uploaded by Ayala Moriel. 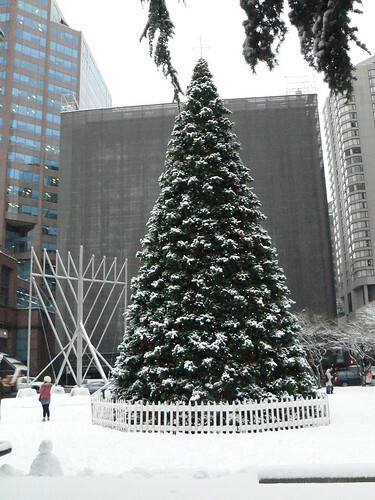 Merry Christmas to all of SmellyBlog readers celebrating. 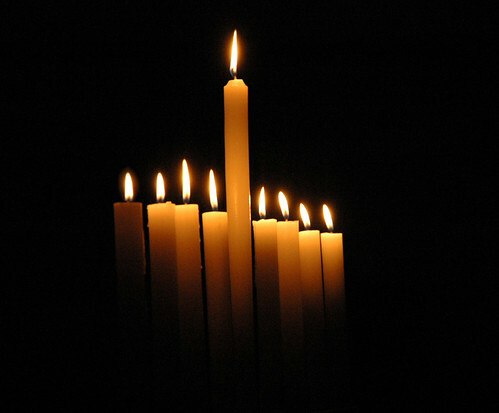 And a continuous Happy Hanuka too - still 4 more candles to light! burning honey, originally uploaded by futureancient. The moment I lifted up the lid of Velvet Gardenia to unveil its fragrance, I was swept into an unfamiliar territory, resting somewhere between dusk and twilight. A perfume simultaneously soft and diffusive like the performance of a soft-focused old-Hollywood starlet. The subtle and demure expressions are delivered by features that were intensified with false lashes and blood-red lipstick. Velvet Gardenia will strike a nostalgic chord for anyone familiar with this heady flower; yet not in the least the conventionally pretty gardenia soliflore favoured by the Southern Belle. This gardenia was grown by candle light, deeming it somewhat waxy and distinctively darker and spicier than any other gardenia-themed perfume. Its dusky complexity stems from combining wine-like top notes, the spiciness of ginger lily and the underlining honeyed sweetness of labdanum. There is absolutely nothing tropical about it; it would be useless on the beach but perfect through a blizzard paired with a fur coat. Bath, originally uploaded by lady eighty. The time leading to the holidays can be stressful and strenuous both mentally and physically. Lots of work to get done before the long winter break. Many parties and social functions to attend and/or organize. Even Holiday preparations such as shopping, cooking and baking can take a toll on your health and stress you out if you’re not careful. Being in the midst of the holiday rush myself, I’ve found that simple little rituals really help to ease out the stress and balance out the overall intensity of these past two months. Giving yourself a little attention, quietly, and being mindful about yourself in the midst of this chaos – even if just for a few minutes – can make all the difference and might save a lot of trouble (i.e. : fatigue, headache, back pain, meltdown or whichever way your system tends to cope with the stress). Soaking in a hot tub in the evening is a great way to relax and also get your body nice and tired before bedtime. It allows to wash off the worries of the day along with the dirt. In Japan, bathing in the evening is an important ritual that all member of the family take part of. Everyone washes before entering the bath, and all use the same water, which is of course very hot! It is also customary to use whole plants (i.e. : Shoubu, a type of iris) or fruits (yuzu) in the bath depending on the season. These plants are believed to help maintain one’s health. 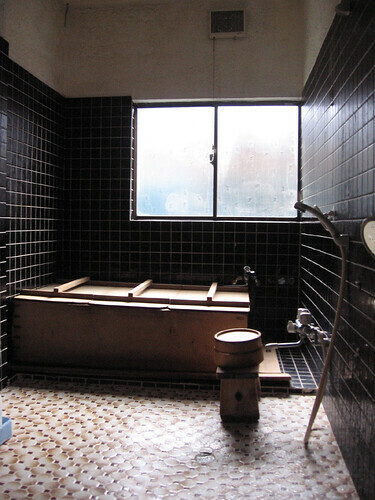 Traditionally, the Japanese bath tubs are made from wood such as hinoki - a Japanese cypress with a very pleasing aroma. I found these awesome bath salts at Daiso (a Japanese twonie/100 yen store located in the Aberdeen Mall in Richmond, BC), which smell wonderful and surprisingly natural (especially knowing their price). I particularly enjoy bathing in the soft light of candles, especially scented; and my Bois d’Hiver candles make a beautiful compliment to this woody bath soak. The virtues of bathing go beyond basic hygene practices. The sound of the water flowing into the tub and swishing around is relaxing and calming. In the soft light, you mind can relax and put behind all the day's worries and stress and ready itself for a peaceful slumber. The act of washing and bathing brings awarness to every part of the body and to the body as a whole. Bathing with your partner can also be a shared time of relaxation and intimacy (schedule and bath size permitting...). And of course you could also argue water's many symbolic meanings of a source of vitality, a place where our life began (the womb), and purity. Hanukkah, originally uploaded by waterbum. 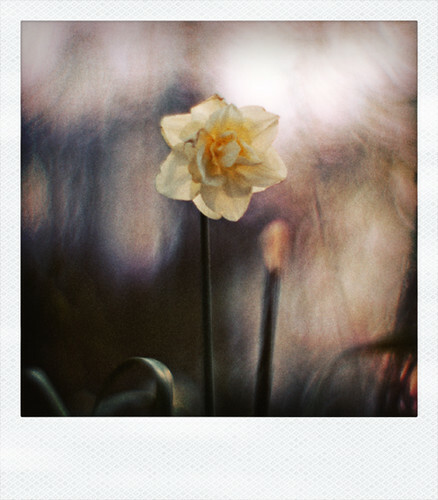 May this 8-day holiday be filled with light and warmth, both physically and metaphorically speaking. Personally, I like the laid-back atmosphere of this holiday (perhaps not so much so in North America, where it has to compete in extravagance with Christmas). Where I grew up, this is just a week like any other week, except that every night there is a party with candle lighting and some fried good. Sometimes it's a small party (just the family) and sometimes it's a little bigger within the community (i.e. : school parties, etc.). It's all about gathering around the lights and enjoying each others' company. P.s. My apologies for my late greetings; I've been deeply involved with getting my little Holiday Soiree together for last night (which was a lot of fun). It required enormous amounts of cookie baking and truffle rolling... That in the end I got a friend to the rescue to fry the latkes! Now I'm looking forward to nearly 3 lazy weeks with my daughter during her winter holiday from school. LesNez Parfums d'Auters has just launched Manoumalia, the 4th perfume in their line. Created by Sandrine Videault, Manoumalia is inspired by Polynesia's fragrant flora and heritage and is composed with notes of Tiare, Ylang Ylang, Fragraea, Vetiver, Sandalwood and Amber. More later, after I've smelled it. The online fragrance community and resource website Fragrantica is holding a blog contest/awards for 2009. SmellyBlog is one of the nominees. 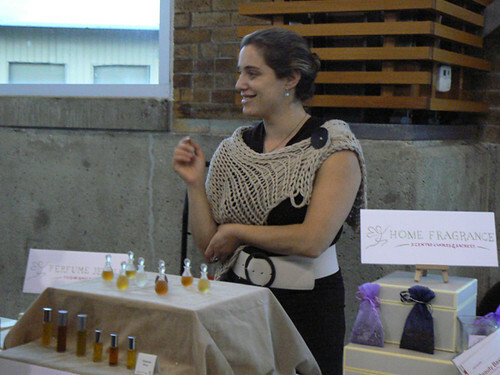 You may register for Fragrantica and vote here. “Sir, the shopping list... It's only questions, isn't it? - It wouldn't tell anyone anything? It would tell what we know by telling what we "don't" know. And it would tell what we would most like to know. b) It included mostly very useful stuff (which of course, would make whatever list I would have seem over-indulgent). Wish lists are very revealing. They may reveal what you’re lacking, what you aspire to be, what you know or don’t know (i.e. : the next generation of iPhone), who you are. But this is only one aspect which makes it difficult for me to come up with a wish list. First of all, things don’t stay on my wish list for long. I either get them right away (more or less) or loose interest in them after a while so they stop being a wish list item even if they appear to be. If you are one of those self-sufficient people who knows how to take care of themselves you know what I mean. Others may interpret this as materialism, but I beg to differ. There is something empowering about knowing what you like, and investing your hard earned money in it, on your own. It makes it a meaningful experience, because you were part of the entire process (including spending your milk money on a much smaller vat, full of flammabale liquids). Another reason why my wish list has been nearly non-existent: it is one thing to make a list for the sake of making one (I do that all the time, and you’ve been my witness). It’s a defining moment in your own history. Where you are heading, what you aspire to be, what defines you now. Are you a No. 5 or are you a No. 19 now? Are you more into dense vintages or into sparse, airy minimalism? There’s a satisfaction in wanting all those things. But if someone just handed to you your entire perfume wish list on a silver platter, would it be all that wonderful? Besides, I don’t really want, need or desire anything at the moment. I am actually quite content with what I have (if I can only find a better way to organize all those lovely perfumes though, I’ll be reaching nirvana). I am happy with my collection (not that it is by any means complete) as it serves my double purpose of enjoying perfumes and leaning and studying them. My collection allows me to refer to old classics and new innovations in this useful art form; to draw parallels between creations from the same perfumer, era, or with a focus on the same raw material, etc. I don’t really need to add to or subtract much from it. Lastly, part of me just likes the idea of surprises, better than gifts. It’s the anticipation. What would it be? And does this person really know me? Can they pick something for me that they’ll know I’d like? So you see, coming up with a list was not an easy task. Especially knowing that someone is actually going to read it and pay attention to it. And so in return, I thought it was only fair to reveal my list too. Although part of me hopes that if I do get a gift, it would be a surprise. But what can I say, after giving this much thought, I am pretty sure I’ll be very happy to find any of these under my Christmas Tree or Chanuka Bush. Reluctant to give away my secrets too easily, I decided to leave it up to him to figure out where I keep it. We’ll see how this plan would work out… For now, I hope you will enjoy reading my fragrant little wish list. And please feel free to comment on your opinion of wish lists and the whole idea of giving “hints” to people you know so they can get you what you want. So, there goes my list (trimmed down only to the bare basics, after getting rid of anything useful such as toolbox for all my scattered hardware, a wooden salad bowl or a bigger-size baking sheets, and an Indonesian hammock stand to replace my ragged couch) and sticking to the superfluous olfactory indulgences only (otherwise my editor would not accept my piece for this blog). Please continue reading the post below if you are remotely interested. 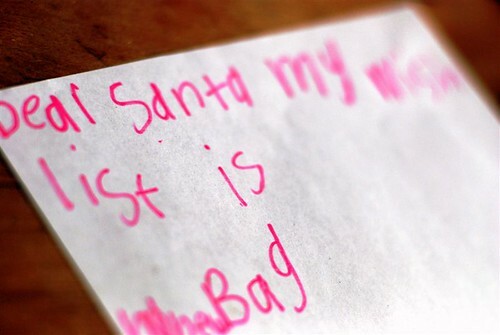 dear santa...., originally uploaded by sapaho. This is by no means a shopping list and none of these items (or their lack thereof) poses a life-or-death situation. These can be found at Daiso and are the best thing you can add to a winter bath. For those not in the know - the newest Les Exclusif eau de toilette from Chanel. I’ve gone through 4mls of this jus within about a week. A full bottle might just come handy and even get used up one day too. But I won’t say my life is incomplete without it. * Other perfumes on my wishlist are Velvet Gardenia (Tom Ford), Kyoto (Commes de Garcons) and Sous le Vent (Guerlain). Very unusual for me to love a floral and be able to wear it. The key for it to work for me is the labdanum base. It also reminds me of tea time at The Empress in Victoria, when I first wore it. I can never have too many of those - I would practically eat this on a daily basis if it wasn't for the fact that I run out of it too soon. 7. Scented body lotion or cream, i.e. : Jo Malone's Orange Blossom Cream, or Editions de Parfums' Carnal Flower Body Creme. I wouldn't mind Mitsouko body cream or Un Jardin Apres la Mousson body lotion either. 8. Freesias, either yellow or white, because they are pretty and smell so good. I had an elaborate plan for three consecutive gift guides for this holiday season, with an environmentally-friendly spin. Unfortunately, I got drowned in the Ayala Moriel holiday rush before I was able to post any of them. Now we are just a little over a week away so it’s time to improvise and get creative in order to make it to the bottom of the to-do list. How about some crafty and fun holiday activities and gifts, some of which you can make yourself, others will inspire and encourage others to be creative. With the days shortening and the temperatures dropping, we are spending much more time at home. Better get those creative juices going instead of turning into couch potatoes, right? I’m even going to try to convince you that these gifts are less time-consuming than shopping around endlessly. Inspire a young family member to delve into the art of natural perfumery with this introductory and simple Perfumery Kit from Elmer’s science kits (available via ArtSuppliesOnline.com). It includes 5 different blends – 5 single notes (apple, jasmine, heliotrope, lily, and one which is plainly peppermint). These are not natural essences by any means (even if the labeling may imply so, by having the Latin name of each plan in the short ingredient list)). However, they are all based in sunflower oil. The package comes with the 5 essences, 5 empty plastic vials and 5 plastic pipettes. It will fascinate any youngster who is interested in science or perfume, or both. Recommended for ages 8 and up, and requires adult supervision. For the grown-up obsessed with the world of aromatic, Nature’s Gift offers many different kinds of aromatherapy and natural perfumery kits, for the amateur perfumer (i.e. : Perfumer’s Kit One) or the fragrance connoisseur (i.e. : Wood Lovers Sampler Kit; Chai Spice Kit). A fine way to dress up any paper – and in particular hand-made paper embedded with botanicals is to immerse it with essences. Cut the paper to the desired size. If you have a scented sachet, place the sachet in a Ziploc bag along with the paper. If you start now, they will be ready for December 25th with a subtle pleasing aroma. Another way of scenting them is to pour an essential oil blend (i.e. : the one above, or even something simpler, such as some rose oil or vetiver oil alone) and place those on a cotton ball. Just make sure the essential oils don’t come into direct contact with the paper, as that would stain the paper. The newest addition to Ayala Moriel's home fragrance line is the scented sachets. These unique blends of dried botanicals, resins and spices are infused with Ayala Moriel's pure perfume blends of natural botanical essences that intensify the aroma of the sachets and truly represent the perfumes they are based on - only meant for your closet. The sachets are made of sheer organza, so that you can enjoy the visual vibrancy of the dry botanical. They are like dry bouquets captured within the fabric, to scent your clothes and linenes. Place in your drawers, in between garments on shelves, or tie to the hanger to leave a lingering subtle scent on your coats, shawls or gowns. Many of these sachets also have the benefit of protecting your clothes from moth and insects, as they contain cedarwood and/or patchouli leaves and essential oils, which are known for their moth repellent qualities. These sachets keep their scent for a long time (I've had mine for a year before releasing them to the public, and they are still very fragrant). They will sure make your stocking smell good. Available in Ayalitta, Bon Zai, Fete d'Hiver, Film Noir, Lovender, Vetiver Racinettes and Viola.$15 each. Our tealights are back in stock, in all 3 scents: ArbitRary, Bois d'Hiver & White Potion. These soywax candles are made from non-GMO soybeans and are pacakged in recyclable tealight plastic containers that are heat resistant and safe to burn. They make an excellent addition to any gift, or can be the gift when grouped in larger quantities. Price range: $4 (ArbitRary & Bois d'Hiver); $6 (White Potion). - Before you ligtht the tealights, group in interesting arrangement to make an interesting lighting effect for your holiday party. - Pair with a sample of the same (or different) scent from Ayala Moriel's line. - If you don't intend to use the candle immediately, store in your closet as you would a fine soap or a sachet. These will make your closet smell wonderful! These gift boxes contain 8 delicious truffles with surprising flavours to savour over the holiday. Flavoured with essential oils and flower essences, these flavours really burst in your mouth and leave a memorable impression. Samples are the best way to try a scent before committing to a larger bottle. And when buying for someone else, is a great way to introduce someone to the line without risking that the fragrance will go to waste. While the sample pictured of the exclusive limited edition The Purple Dress (coming out in in 2009) costs $17 per 1ml vial, most of Ayala Moriel's samples are less pricy, and are $8 each for 1ml parfum extrait. This amount allows you to live with the scent for a while (it will easily last for a week) and also looks adorable and fits nicely in any pocket or purse. We offer gift certificates for any budget, and we all know that even a little bit counts when you are saving up for that dream perfume! Just tell us the amount and who it's for and we'll customize your gift card, tie a satin ribbon for a finishing touch and tuck it in a fancy, miniature vellum envelope. Ayala @ Portobello West November 2008, originally uploaded by Ayala Moriel. I'm very glad to say that the food drive was quite successful - we've raised $21 to Greater Vancouver Food Bank, which will in return buy people in need in the Lower Mainlad $63 worth of food (that can make one giant meal for at least one family!). Thank you for participating, and buying truffles to support this cause! I will match that amount and donate a total of $42 to Greater Vancouver Food Bank, in hopes that no one will go hungry. All we need to do is spread the wealth that we have and share it - and the world will be a better place to live. Also, we have winners for the draw! I will be holding another fun draw at the Holiday Soiree coming up Sundary, December 21st at the studio (6-11pm). Hope to see you there! snowy night, originally uploaded by Sasakei. It's snowing for the first time this year, and I'm snuggling up in bed snuggled up in my cozy pyjamas and perfumed with my latest version of The Purple Dress (with champaca, henna flower, broom and oud) and wrapped in Kyara incense smoke. What would you wear when it first snows? Share your thoughts below and enter to win a sample of The Purple Dress. Just in time for Christmas: A group of Franciscan researchers found what may be perfumes, ointments and make-up products from Maria-Magdalena's time (found in the town of Migdal/Magdala in the Galilee). They also seem to come in really nifty and easy to carry packaging too! The Signage, originally uploaded by Ayala Moriel. This weekend at Portobello West - full 2-day shopping experience where Vancouverites can connect with local indy fashion designers and artists. This time, we are having a food drive to support Greater Vancouver's Food Bank. Vendors and guests at the market are invited to donate non-perishable food items or money to the Greater Vancouver Food Bank. Each $1 you donate is worth $3 of food, that will be given to families and individuals struggling to put food on the table this winter. To contribute, I will be donating $3 from each truffle box I'm selling to the foodbank, and also $1 from each individual truffle sold to help this cause. Your help is much appreciated! Charisma Truffles - white chocolate with vanilla pods, osmanthus, spearmint, jasmine sambac and Matcha tea. Immortelle l'Amour truffles - New flavour! - milk chocolate with maple essence, sweet wild orange, cinnamon and ginger. Gift boxes (pictured below) are packaged in recyclable tins and are filled with 8 truffles (unless there's more room!) - $15 each ($3 will be donated to the food bank). Individual truffles will be sold for $2 each ($1 will be donated to the food bank). Due to popular demand, I'm pleased to announce that the entire Vetiver Series is now available via my Etsy shop. This little gift-wrapped jewelry box contains all 4 mods that lead to Vetiver Racinettes: Vetiver Blanc, Vetiver Noir, Wilde Vetyver and Vetiver Rouge. Thank you for your interest and support of this fascinating project! As if to rescue me from drowning in the holiday rush - the package from my friend Yoko in Japan today brought a bit of peace and tranquility to my space, even if just for a short moment inbetween one task to another. This thoughtful package contained incense, sachets and meditation candle from Ise Jingu, one of the most sacred and powerful places in Japan. Kyara (Agarwood) - I researched a bit on that one, and this is the finest kind of agarwood incense, which is very dark (the stick is black in colour) due to the black "resin" in the agarwood (it really is the result of the decay from the parasites that growin in aged agarwood trees and impart the uqnie agarwood scent to the wood). I've burnt the Kyara and it has an immediate effect on me of centering, grounding, balancing and relaxing. Exactly what I needed in this hectic time of the year! There was also a traditional Japanese candle in the box, made of hazenoki wax (this is the object that looks like a little rolling pin in the photo above). The wick in these candles is made of Japanese handmade paper. In perfect timing with my last post, today I received a package form my friend in Japan, full of fragrant surprises, one of which is this elegant Japanese neroli (Citrus tachibana - aka Tachibana orange) sachet. As most things Japanese, it is very balanced: even though it is fresh smelling, it has a depth and interest. I have a reason to believe (even without opening the sachet itself - I have a feeling this will end in a disaster!) that is has a base powder very similar to that of the Japanese body incense - most likely a mix of sandalwood, camphor, cloves and other woods and spices and here it must have been also infused with some of the above mentioned neroli essential oil. It’s fresh but not shallow. Japanese sachets are very similar to Japanese incense in aroma, and are usually packaged in scraps of Kimonos, silk or barocade fabrics. Most of the Japanese incense houses also make their own unique sachets. Everything is accompanied with Japanese literature so I am hoping to find out more later on this evening after I meet with my Japanese-Canadian friend here in Vancouver for some interpretation... I will update this post accordingly later on. Sachets were very popular in traditional Japanese culture, where they served a dual purpose, both practical and esthetic. Traditional garments such as Kimono were not to be washed or laundered or else the beauty of their intricate embroidery and dyes would be compromised. Instead, they were stored in the company of fragrant woods such as cedar or camphor, or dried leaves and spices such as patchouli and cloves, that would impart a pleasing aroma to the clothing and also keep away the month. The art of Japanese incense includes also “incense sachets” - mixtures of ground woods, spices and herbs that promote the good scent of fabrics as well as protect them from the moth. The first Bon Zai sachet was born especially for my client Yoko, who carries my line in her antique shop in Japan. I was out of the Viola sachets that she ordered, so I made her a Bon Zai sachet instead, which turned out to be a favourite! Bon Zai sachet is made of several dry botanicals - red sandalwood chips, vetiver rootlets, patchouli leaves and whole rosebuds. These were than infused with cedarwood oil, shiso oil, rose otto, juniper berry and red mandarin to create the full spectrum of Bon Zai’s distinct aroma, adopted for a sachet use. Besides the pleasing scent of the sachet, it is also a good moth repellent thanks to the patchouli leaves. Basenotes has just opened the polls for the 9th annual fragrance awards. Click here to nominate your favourite perfumes, perfume houses and fragrance blogs. Ayala Moriel is proud to announce the latest retail location in Vancouver: Noam Gagnon's Wellness Centre Beyond Pilates. Guests to Beyond Pilates studio have recently enjoyed the candles burnt at the studio - Bois d'Hiver and White Potion. Now they can take them home with them, and also pick a perfume for personal use from a collection of 7 perfume oil roll-ons: ArbitRary, Ayalitta, Bon Zai, Espionage, Palas Atena, Tamya and White Potion. Beyond Pilates is much more than just another Pilates studio; it is, as the name suggest, a centre for well-being, where you can really connect with yourself through your body and learn how to maintain your well-being through correct posture and breathing. The teachers at Beyond Pilates are extremely knowledgeable and helpful and offer group and individual classes different Pilates styles - Reformer, Mat, Low Chair, Tower, Combo and circuit classes, as well as Gyrokinesis and soon even will offer prenatal and postpartum calsses. Beyond Pilates is also the home for other therapists and practitioner - where you can find therapies such as Shiatzu, Homeopathy, Rolfing, Cranio-Sacral Massage and more. Latest Sahleb stock updates: I thought I should let you know that the number of Sahleb bottles have shrunk down to the last 4 (yes, only four) bottles. I have received a new shipment of orris butter with 15% irone, but unfortunately it does not scrape the bottom of the quality of the one used for Sahleb. So unfortunately, this is all there is to it! Our Roses et Chocolat tea is down to half the stock, even though we just had a full stock last Monday. This is flying out the door fast! If you need it, than order it now before it's gone again. * Tirzah and Gaucho are out of stock and won't be made again until the spring. A new shipment of our Bois d'Hiver and ArbitRary candles should arrive any day now. But judging by how fast they went, you will be wise to pre-order them now. We only make them in batches of 8 candles at a time. This time we will also have extra 10 tealight size of both these fragrances. White Potion candle is out of stock and will be back in a couple of weeks. Again, we highly recommend pre-ordering if you want those candles, they are going out fast! 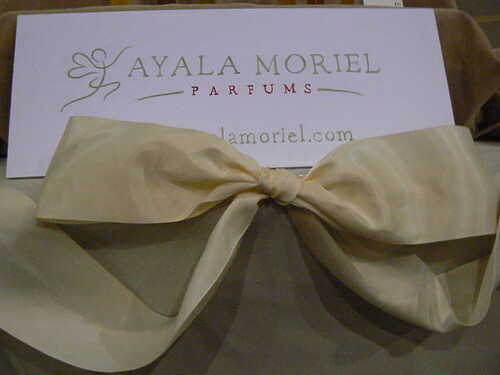 The brand-new addition to Ayala Moriel's home line are the scented sachets. Film Noir sachets are extremely popular (patchouli and cacao nibs infused with vintage patchouli oil and cacao absolute) and already has a few sachets pre-ordered. If you want more of those, please let us know how many so we can make sure we have enouhg for you for before the holidays! Vetiver Racinettes sachets are out of stock, but we'll have more next week. You can order full batches here. 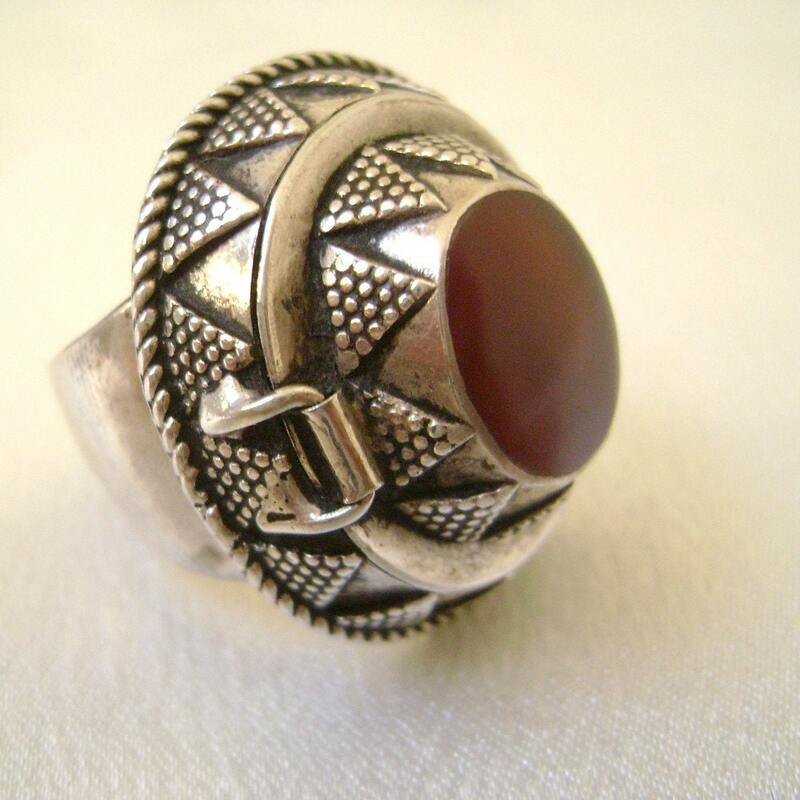 I've just posted my newly found poison ring treasures on my Etsy shop. Please take a look! These statement jewelry pieces make a stunning gift. Congratulations to Rachel, and those of you who haven't won, don't worry; we will have monthly draws from now on with Ayala Moriel's business partners one of which is Beyond Pilates, where you can get your Pilates training from the top teachers in the city. The centre was founded by dancer and choreographer Noam Gagnon and won The Best of the City award from the Georgia Straight for 2008! At Beyond Pilates, you can often enjoy Ayala Moriel's candles while getting in shape and breathing deeply! For more info about classes and schedules, visit Beyond Pilates website. 2) Come and join me to light the first Hannukah candle and enjoy some Sahleb (pudding beverage that is a winter treat and also my the inspiration for my newest perfume of that name). This Holiday Soiree takes place on Sunday December 21st 6-11pm at the studio #314-1230 Haro Street Buzz #295. RSVP so we make sure we have enough sahleb for you! Warm regards and happy holiday season!